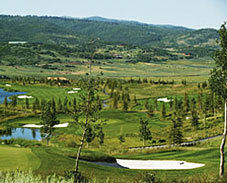 In and around Park City, there are five private golf courses and nine courses open to the public. 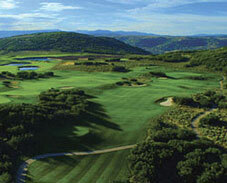 One of Alan�s favorites is the Park City Municipal Golf Course in the center of town. It�s a beautiful course in design, maintenance, and scenery, and locals can even buy a season pass � just like for skiing. 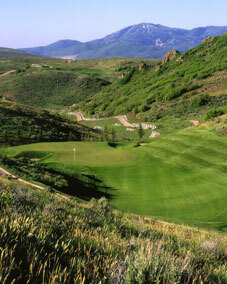 Alan has assembled some tips for playing the course from, let�s just say, repeated experience. A great starting hole. Not prudently reachable in two (even long hitters: note a serious amount of danger around the green). Therefore, a good strategy is to start your round with a 3-wood or less, as the hole is a bit narrow. This is a terrific hole for getting warmed up by not being over aggressive. Plays, even on windy days, pretty much to its marked length. It�s not as much downhill as it appears. The pond is longer to the left side; favor the right if in doubt about the carry. The angle to hit is the crux of this hole. Long hitters: careful, as if you go straight over the bunker, or left of it, you are likely to run through the fairway into trees. There is concealed (elevated pond) water on the right side. The second shot is the difficult one; it gets narrow. Many players will hit less club here to remain safe, even though the shot to the green is a bit longer. The green is large, so this is prudent and reasonable tactic. Favor the left side of the fairway, as the slope from left to right will take even a soft fade out of play. This is a very intricate hole. Not much required on the first shot, but the second is a very touchy mid- to short-range shot. If possible, try to land below the hole; this is one of the toughest greens on the course. For some reason, people seem to hit out of bounds left here a lot. The fairway is large; aim just a bit right of the tree for generous roll. The green is a bit less steep than most people read it. A challenging, long and uphill par 3. The green is large; just be sure to take enough club off the tee. If you are not hitting straight so far, take less and play a lay-up and hope to get up and down. Shots not straight on this hole are likely to end up under trees. A great hole for the end of the front nine. I see a lot of people leave the second shot a bit short; it is just a bit uphill which is hard to read. Caution: there is a small stream cut off the right side of the fairway not in sight from the tee box. This hole has been modified to be a bit shorter than originally designed. Very straightforward, except that the right margin of the fairway at the dogleg left is a bit closer than many people realize. I see long hitters end up in trees or o/b there frequently. This hole does not reward length, and in fact imperils the longer hitter, as there are problems on both sides of the fairway, and blocked angles to the green farther down. Best to aim for the large willow tree on the left side, and stay well short of it for the best approach shot. The drive is crucial, as this is a long hole. Also, don�t be short on the approach (and it�s a bit uphill!) as there is abundant water both left and right short of the green. Enjoy! This is a scenic, straightforward par three, a respite between two demanding par four holes. This hole destroys people. The tip: don�t overhit the drive trying for length. There are trees both left and right; you need to be in the fairway off the tee. The good news: from the fairway, although the hole is severely uphill (like two clubs worth!) the green is enormous and you really CAN get there in two shots, even if the second is a wood. Another relaxing hole, except long hitters need to be a bit cautious. The trees on the right side at the dogleg left are in range for you! Somewhat similar to number 1 � it�s a long par five; don�t expect to reach in two. Therefore, plan comfortable, less-than-maximum swings off the tee and second shot. People who overhit on this hole frequently are in distress under the abundant trees both left and right. Take it easy for the first two shots! This looks, and plays for the unwary, a lot harder than it should. If you�re not hitting straight today, short is fine. The green is uphill, an aggressive up-and-down often yields par even for tee shots which are short. Conversely, pin-high but left or right is problematic. Full length off the tee is not necessary: just get in play. This is a layup hole. Sometimes I try for it in two. You may be tempted. For me, at least, a big mistake.